Babe is an adventure and arcade game based on two popular films with a nice pig in the lead role - Babe the Gallant Pig (Babe - a pig with class) and Babe: Pig in the City (Babe - a pig in the city). 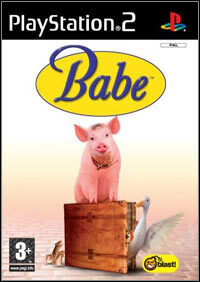 BABE STARS IN HIS FIRST ADVENTURE FOR PlayStation®2, BASED ON THE CLASSIC FAMILY MOVIES FROM UNIVERSAL PICTURES! It's a very special day for Babe!The brave little sheep-pig has been invited to take part in a grand tournament, where the best sheep-herders from around theworld will compete for ultimate glory. But there's one problem: the tournament is many miles away in the big city! Can you guide Babe and his sheep safely to the city and win the competition? Easy to learn and simple to control, Babe is perfect for players of any age! 50 Challenging Puzzles within 6 Levels! Help Babe herd the sheep to the goal – but make sure they don't get trapped! See Babe visit all kinds of strange places, including a hotel, a hospital and even an airport! Game score 3.4 / 10 calculated out of 26 players' votes.